Open Mon, Wed, Thurs, 11am-midnight, Fri-Sat, 11am-2am, Sunday 11am-10pm. Closed on Tuesdays. We write up, on average, only one out of every four restaurants we try. Simply put, our goal is to tell you about the good in what’s out there. If we’re unable to find something we’d feel compelled to share with a friend, we’re not likely to share it here. Even with that batting average established, we’ve had a particularly rough streak this summer (as you may have guessed by the frequency of our posts). And, many of these unwritten experiences came from new restaurants serving some variation or another of Southeast Asian cuisine. We’ve had “pad thai” served as spaghetti noodles pan fried in what tasted of nothing more than soy sauce, eye poppingly gorgeous Vietnamese presentations almost completely devoid of any recognizable Asian (or other) flavors, and been presented with menus with dishes numbering in the hundreds… each more insipid than the last. I suspect much of this comes from a desire to please the American palate – to reinvent Thai or Vietnamese as the Chinese have successfully done with their cuisine – and is attempted under the assumption that this is easily achievable. What is working is Siem Reap – an unassuming new Cambodian/Thai restaurant found in the shadows of the new casino, and named after a town in Cambodia situated next to a far more impressive edifice. After a season of kissing frogs, this restaurant is sweet sweet redemption. Our first clue to the goodness to come was the menu – not so much the items themselves, but more that the relatively modest number of items listed indicated that they weren’t trying to be everything to everyone. Our next clue was the lagniappe – a small salad of pickled carrots, daikon, and green papaya garnished with roasted peanuts. A simple dish, and a perfect flavor combo to set the tone for the evening. Sitting proudly atop the appetizers list were the stuffed chicken wings – a new concept to me, and one that I’m more than glad to be acquainted with. Four plump wings arrived, deboned and stuffed with what amounted to a spicy, lemongrass inflected chicken sausage threaded with glass noodles. Juicy, complexly flavored, and sizable, each of the six at our table deemed these absolutely brilliant. We ordered seconds. You want these, preferably now. 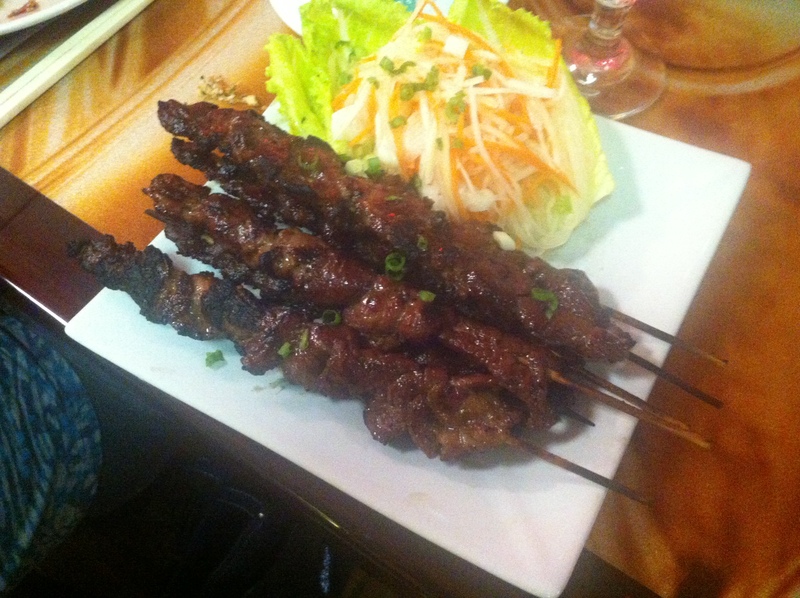 The beef skewers were far from the typical, anemic satay chew toys. These were actually very good, with the subtle marinade allowing the exceptional flavor of the conspicuously high quality beef to shine through. Add on the skillfully controlled char, and we were left wondering if we’d been temporarily transported to Fresh Street. 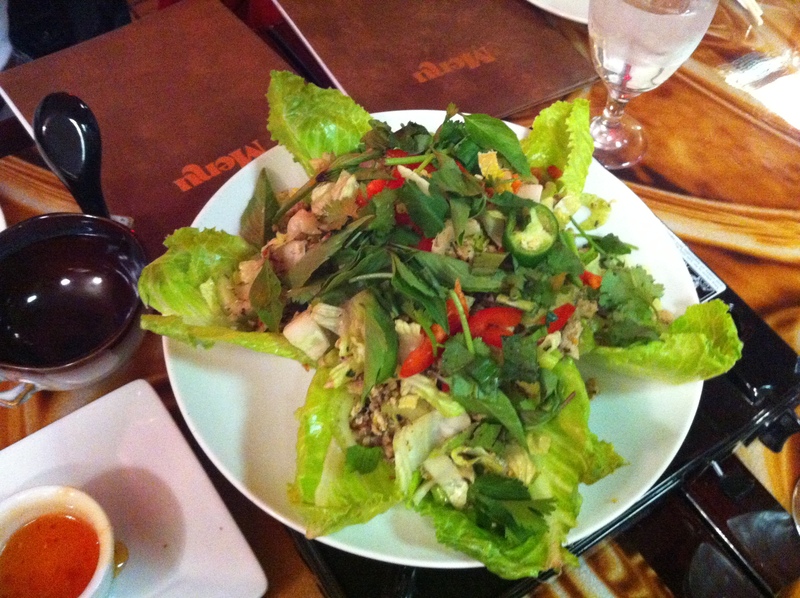 The larb – a cold minced chicken salad marinated in a lime sauce – was pleasant enough on its own merits, but didn’t have the bright citrusy punch of the (to me) preferable Thai preparation. Our selection of mains was strongly influenced by the cold weather, which led us to rice soup and the curry ‘fondue’ hot pot. The rice soup was a pleasant, vaguely congee-like concoction served in a rich and somewhat sweet broth with pho-like sides of herbs, lime wedges, and bean sprouts. Chinese-style savory crullers were also provided, and cubes of pigs blood were an option. If the photos don’t convey it adequately, let me be clear: this almost certainly would’ve been enough to feed all six of us; we actually had leftovers enough to feed two. 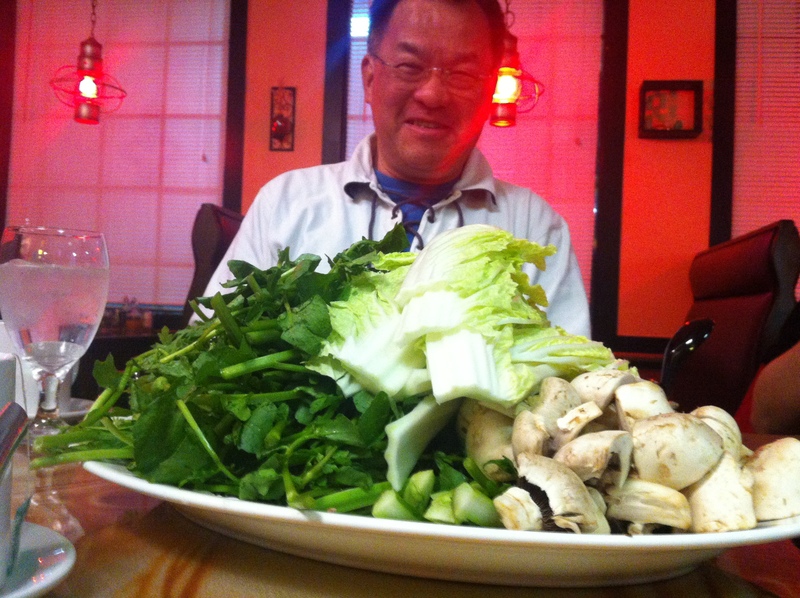 It also impressed us, once again, with the freshness and quality of the raw ingredients. The broth, an exceptionally mild curry liberally dosed with fish sauce, seemed the perfect seasoning for everything… save, perhaps oddly, for the beef. 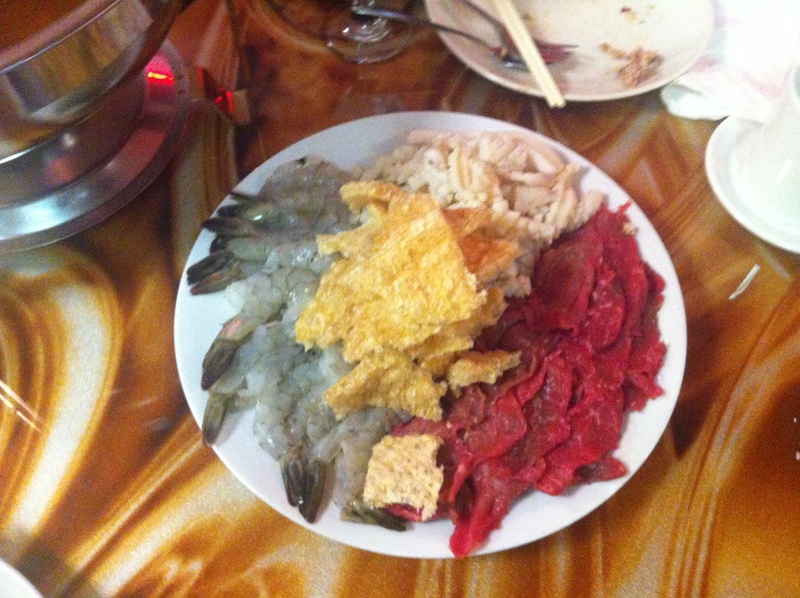 Vegetables were scooped in, squid and shrimp bathed, and beef quickly swished around. We were instructed that the pork rinds – an intriguing inclusion – were to be soaked until soft. That took some time, but was well worth it as the flavor was exceptional. As was most everything else. It was good, and fun, and an absolute steal at $25.95. 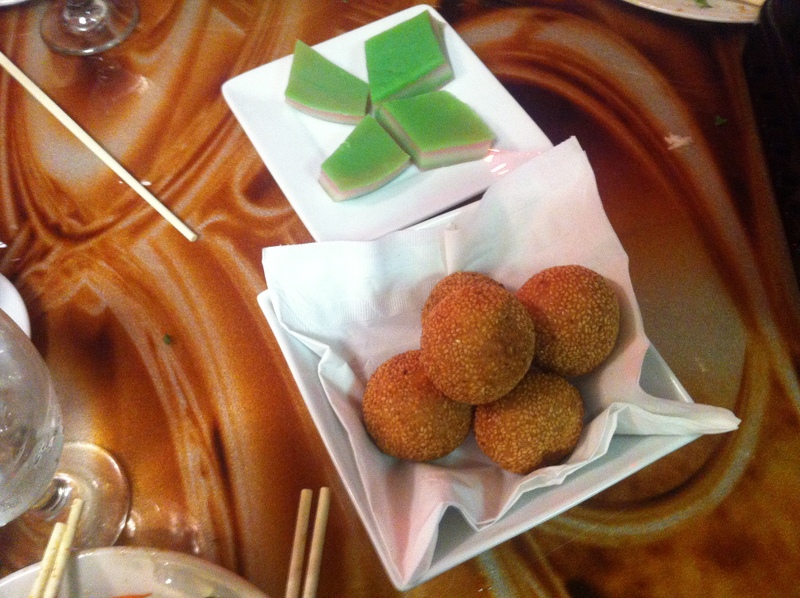 We finished with two fine, if unexciting desserts (to be fair we might’ve thought better of them were we not so stuffed…) – sesame balls with yellow bean paste a coconut/rice jello dish. So, to wrap up: 6 people ate staggering quantities of thoroughly enjoyed food, and paid $75 in total for all of it. Service was pleasant, knowledgable, and prompt. The space was clean and pleasant. In it’s west side environs, Siem Reap is nothing less than an oasis in a culinary desert (mobile food excepted, of course). Do check them out. This entry was posted in cambodian. Bookmark the permalink. Thanks for these reviews, but would you mind also posting reviews of restaurants of which you guys aren’t fans? Definitely not asking you guys for a hit-job or anything, but such reviews of mediocre restaurants might save the rest of us an unnecessarily trip, or better yet, offer opportunities for us to give a second opinion, be it from our own different perspectives or the restaurants’ own improvement over time. 1) There’s just too much out there! New stuff is popping up all the time, and we’re often first among local food writers to try them, so we’re rarely able to return to each location to follow up on our initial appraisal. To us, it’s unfair to write a bad review after only one visit. And, selfish though it may seem, who wants to try a bad place 3 times just so we can confidently state that it’s bad? And do that in lieu of continuing to search for something good? 2) To the extent that our reviews have an influence on a business, we see that influence as a responsibility to be taken seriously. Most of these restaurants are not well-funded, and are usually the result of a family’s life savings being depleted (and then some). We’re often trying them within a month of opening, which means we’re visiting while they’re still trying to figure it all out. They may change for the better, and we’d hate to hobble that with an easily ‘google-able’ mark of shame – unlike a print article, that doesn’t go away. We do keep our ears to the ground, and have in the past returned to restaurants we’ve not liked initially when we’ve heard good things from (trusted) others later on. 3) We try to keep some perspective on our place in the scheme of things. We’ve been to Somali restaurants we didn’t like that pull big Somali crowds, and we’ve been to seemingly unlikeable Asian restaurants that pull big American born & bred crowds. From our point of view, we get less mileage out of telling you those restaurants aren’t enjoyable than from telling you which restaurants we think do make for a good experience. To wrap up: It’s not that we’re philosophically against writing bad reviews, it’s mostly that they’re incompatible with our approach to research. The upside of the approach is that we believe we’re introducing our readership to more good and interesting new ethnic restaurants than anyone else in town. Everything I’ve tried so far was quite tasty. The A Mok, while delicious, could have been a slightly larger portion for the money. Conversely, the Mussels and Seaweed Salad were well-proportioned with great flavor; my friend calls the Seaweed Salad the “sushi salad” because its kind of like a de-constructed sushi roll on a plate. 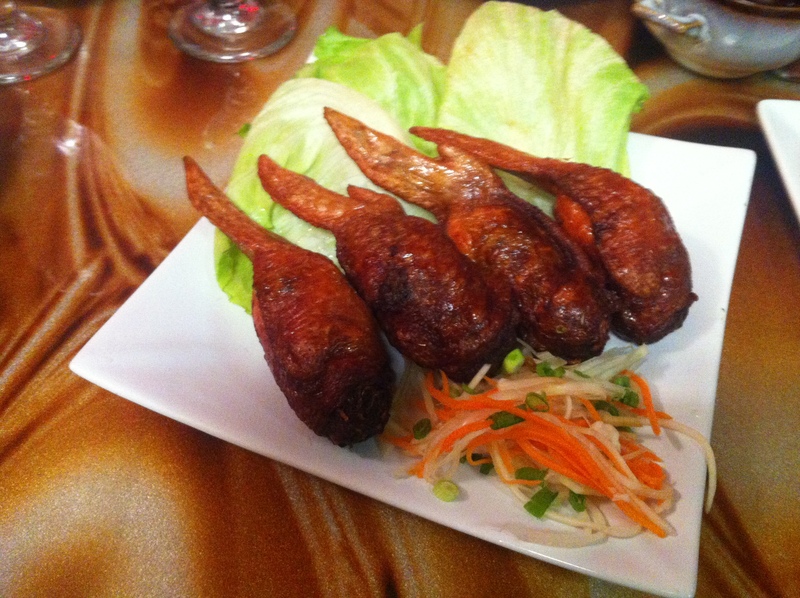 My fave dish so far is the Stuffed Chicken Wings with the 3 accompanying sauces…mmmmmm. 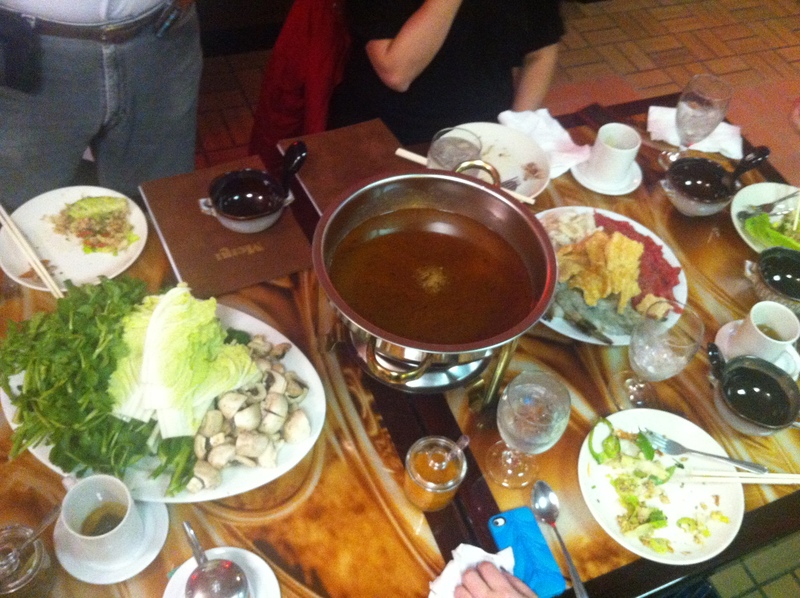 Can’t wait to go with a couple more people and try the Fondue Hot Pot! During lunch last Friday, 2/15, I was informed they have applied for and been granted a beer and wine license. Based on the conversation it sounds like service will start in a week or two. 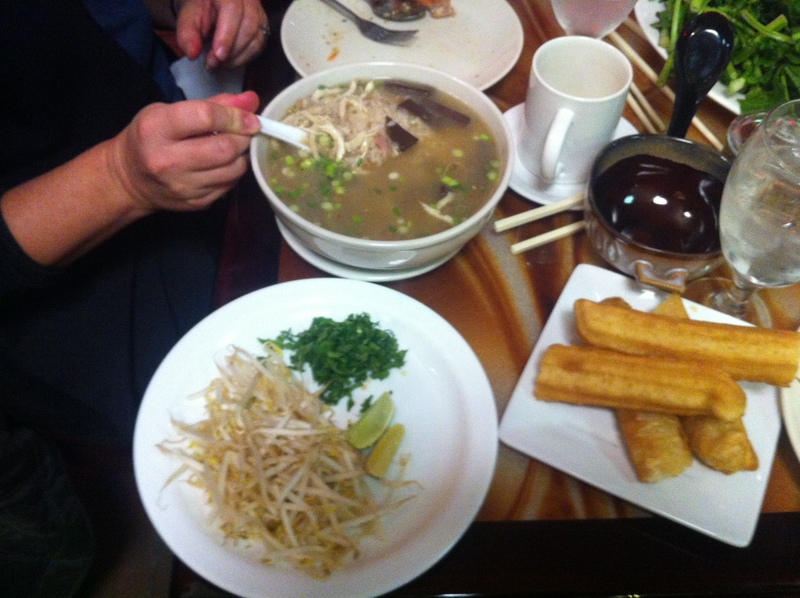 We were impressed by the reviews but were, unfortunately, less impressed with the food (March 23, 2013). The duck had more bone than meat, the papaya salad had little to no papaya or papaya flavor (I was born and raised in the Caribbean eating tropical fruit. I can tell). The beer was sold (Singha) so that is good. The service was prompt but the one lady serving us was way to busy to pay attention to the details. The appetizers were better than the meals. Their stuffed chicken wings were fantastic and different. I found the shrimp srping rolls to be refreshing, light, and fresh. So those are pluses. It’s not unusual for duck to be served with the bones left in in many Asian preparations, but beyond that we can’t vouch for theirs as we haven’t tried it. 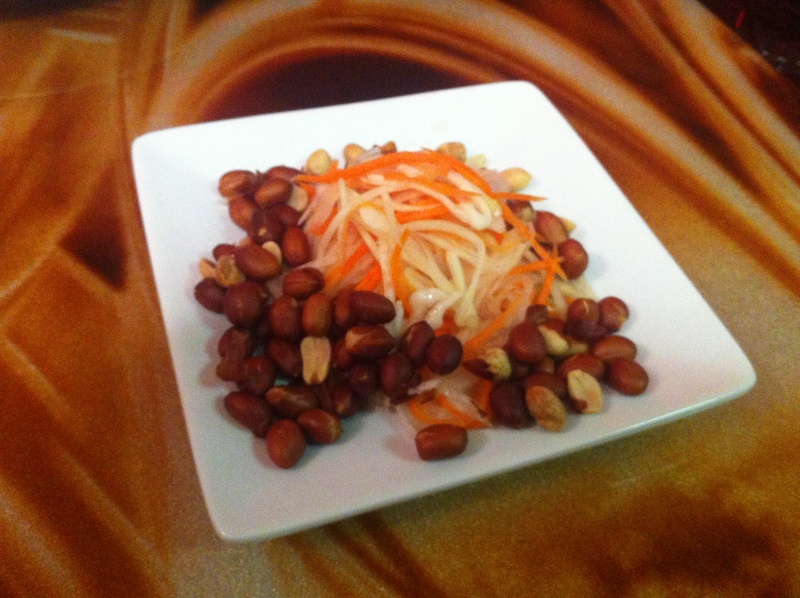 The papaya salad might be a ‘lost-in-translation’ sort of thing. All SE Asian papaya salad preparations use unripe papaya that really doesn’t have much (if any!) of the flavor or color of the ripened fruit. It should look like pale strands and be fairly crunchy. We’ve tried theirs, and at least in our experience it was entirely consistent with what would be expected. I had a few meals that were flavorful Siem Reap versions of Viet dishes. I will go back and try the more authentic dishes. The owner was very nice and accommodating. My wife and I ate here a few weeks ago. To me this place was an absolute diamond in the rough! 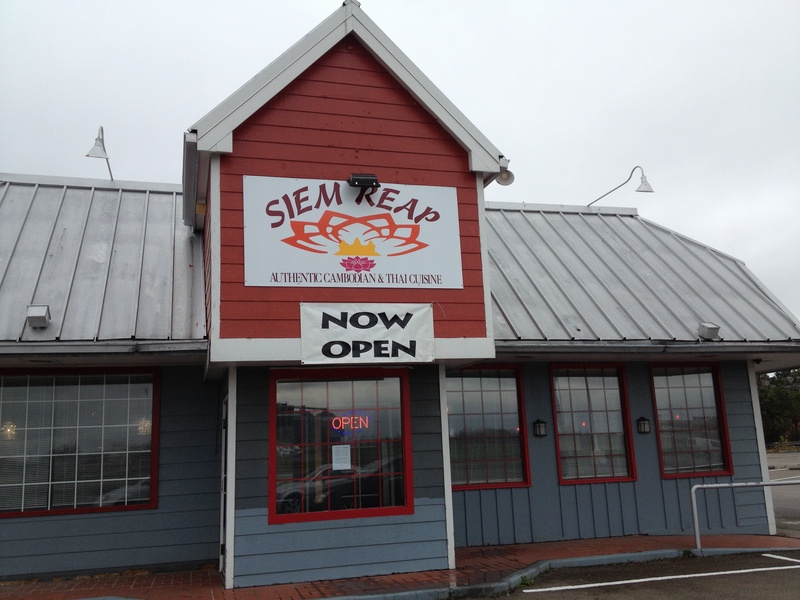 The service was excellent, the food was excellent and the atmosphere was pleasant. There was also an accountant (freinds with the owner) that gave some helpful tips and business card. Perhaps it was just my attitude about things that day, but in summary I was very pleased with the whole experience, great food, great people…..
Mike Siem Reap is closed on Tuesdays. We have updated the information on our website. Looks like another gem has closed. Went by here today and saw a banner for a different restaurant out front…maybe Mexican? My friend called the number and there was no answer.